The Ful10 Fund will be donating $1,000 to Friends of the Mississippi River in support of their preservation efforts. Now nearly a forgotten style, Mild ale originates from England, where less than a century ago it represented the majority of beer brewed there. At 3.2% ABV, Fulton Preservation Mild is the definition of a session beer. Six grains, including flaked oats and Britain’s prized Maris Otter, lend it a garnet brown color, silky mouthfeel and surprisingly substantial body. Preservation greets your palate with a subtle interplay of nutty, roasty, and toffee malt character. It’s so easy to drink, you’ll soon find yourself ordering another, and another – if our brewers haven’t finished it all already. There’s more to this Mild. Preservation is named in honor of local non-profit Friends of the Mississippi River. Since 1993, FMR has worked to preserve and improve the quality of the Mississippi’s waters. The folks from FMR will be joining us at the taproom launch tomorrow, and our Ful10 Fund will be donating $1,000 to support their ongoing efforts. 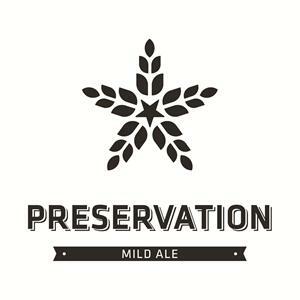 Preservation will be available on draft and in growlers at the taproom, and you'll also be able to find it on draft at local bars and restaurants. We won't be limiting the availability of growlers, so you can get them until we run out. Better yet, growlers will be just $10, and pints can be had for just $4 (tax included, as always). No bottles this year, unfortunately. TAPROOM UPDATE: NOW OPEN EVERY WEDNESDAY - AND WE'RE BUILDING A PATIO! Just in time for summer, we're finishing construction on a new patio in front of our brewery. It'll be a great place to enjoy all of our taproom beers and sodas as well as food truck fare. We're working with our friends atTangletown Gardens to bring a little greenery into our urban setting, and we'll be expanding bike parking as well. We expect the patio to be open in early June, and we'll be adding finishing touches over the remainder of the summer. Also, your midweek happy hour planning just got a little easier: starting June 5th, our taproom and patio will be open every Wednesday from 3-10, Twins game or not. In recent months, we've asked for your support at the Capitol. First, as a member of the newly-formed Minnesota Brewer's Association, we advocated a change to the law that cut off breweries from selling growlers after they surpass 3,500 barrels of total annual production. After negotiating an increase in that limit to 20,000 barrels of production, our proposal was adopted into the omnibus liquor bill, and we're happy to report that Governor Dayton recently signed the bill into law. The law change means you'll still be able to pick up a fresh growler at Fulton and some of your other favorite local breweries as we surpass 3,500 barrels this year. Just as importantly, the ability to continue selling growlers will help Minnesota's packaging breweries continue to invest in our businesses -- which means more jobs and more local beer for everyone. Just when we thought we could be content with a good year at the legislature, we were hit with a surprise: The House of Representatives proposed a 600% increase to the state excise tax on alcohol. While small brewers such as Fulton would be exempted (at least for a while), we opposed the change because of the devastating effect it would have on the entire beer industry. The tax would have effectively raised the price of a case of beer by $3-$4. The distributors and retailers who bring our beer to you would have suffered badly, and larger local breweries like Summit and Schell's would have been tagged with tax increases of over a million dollars a year. Thankfully, the Senate flatly refused to include the tax increase, which was seen as both regressive and damaging to Minnesota's economy. We appreciate the support of everyone who called, emailed, and wrote our legislators and Governor Dayton to oppose this bill. Get yours tomorrow (Friday) at the taproom. As much as we love brewing subtle, balanced beers, now and then we need to shake up the establishment. One weekend a couple of our brewers quietly brewed an over-the-top IPA on our pilot system. A few samples made it out, and before we knew it, everybody wanted some. We didn't have the tank space to make a full batch, but we soon realized that if we didn't brew more, we would have a full-scale insurrection on our hands. Then we remembered: We have a Garage Series for that. Insurrection's flavor profile is spearheaded by Nelson Sauvin and Mosaic hops added at a rate of nearly 4 pounds per barrel. Both hops are new breeds, and they combine to overwhelm the senses with an onslaught of citrus, white grape, and blueberry notes. An equally aggressive malt bill provides serious backbone and an ABV of just under 9%. We'll be tapping the first keg of Insurrection at our taproom this Friday, and we'll have a limited amount of growlers available this weekend and next. Starting on Monday, May 6th, you'll find Insurrection on draft around the Twin Cities. As with most of our Garage Series beers, Insurrection won't be around for too long, so grab a pint when you have the opportunity. We try to stay out of the political fray when possible, but every now and then an issue comes along that we can't ignore. The Minnesota House of Representatives has included an increase in the alcohol excise tax that would be applied to beer, wine, and spirits sold in (not just produced in) Minnesota. For beer, that increase is a staggering 600%. While there is an exemption in place for Minnesota's smaller brewers, the tax would ripple through our entire industry and we would all feel the effects. Minnesota's growing breweries would face a massive barrier to future growth, and our established breweries such as Summit and Schell's would be impacted immediately. Out-of-state craft brewers would be less likely to ship their beer here. Bars and restaurants and liquor stores would lose sales. Distributors would likely have to lay off employees. And beer drinkers would be paying about $3 more per case. 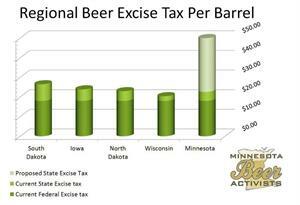 We believe that regardless of one's political leanings or views on taxation, this massive increase in excise tax is unwise policy and destructive to Minnesota's economy. If you agree that the proposed increase is unreasonable and you'd like to let our lawmakers know, you can learn more about the issue and find out who to contact at http://stopmndrinktax.org/. If "It's the most wonderful time of the year" wasn't already taken by some other holiday season, we would've applied it to American Craft Beer Week. It's the week when craft brewers across the country bring out their best stuff to celebrate all of the creativity and diversity our vibrant industry has to offer. We'll be out in full force every day of the week. Some of the highlights: On Tuesday the 14th, we'll be at George and the Dragon with 5 Fultons on tap, including The Expat and War & Peace. The next day, Barrio 50th & France will feature The Ringer, War & Peace, and one of the few Insurrection casks we filled. Come hungry, because the kitchen staff will be whipping up War & Peace lamb barbacoa empanadas, bacon-wrapped Sonora dogs with Sweet Child mustard, and Lonely Blonde-battered Mahi Mahi tacos. For more American Craft Beer Week events and the rest of our May schedule, click over to our events calendar.